• Open—In most applications, you display this dialog box by selecting the File, Open command, or by pressing Ctrl+O. • Save As—You usually display this dialog box by selecting File, Save As. Or, if you’re working with a new, unsaved file, by selecting File, Save, or by pressing Ctrl+S. • To perform maintenance on a particular file or folder, right-click the object to display a shortcut menu like the one shown in Figure 1. Figure 1. You can perform most basic file and folder maintenance right from the Open and Save As dialog boxes. • To create a new object, right-click an empty section of the file list, and then click New to get the New menu. 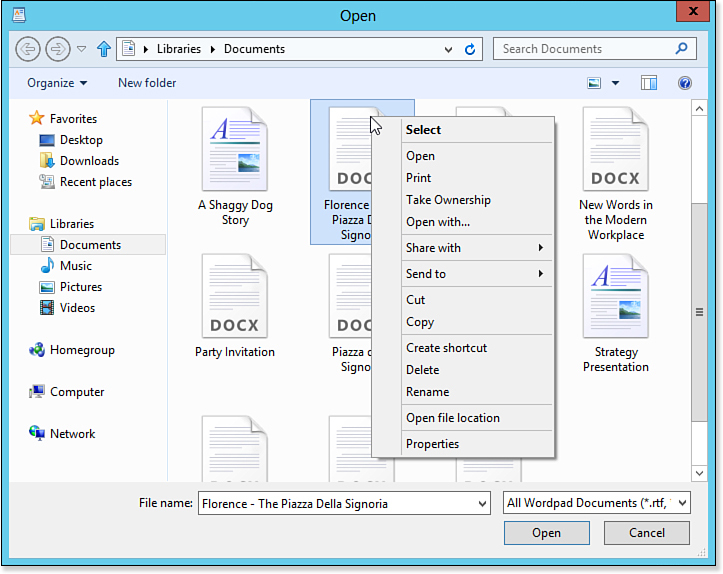 • To create a new folder within the current folder, click the New Folder button. We mentioned earlier that Windows is gradually lessening the importance not only of drive letters, but also specific file locations. As an example of the latter, note that file libraries are really virtual folders that can consist of multiple locations. If file location will become less important, what can you use to take its place as a basis for file organization? Content seems like a pretty good place to start. After all, it’s what’s inside the documents that really matters. For example, suppose you’re working on the Penske account. It’s a pretty good bet that all the Penske-related documents on your system actually have the word Penske inside them somewhere. If you want to find a Penske document, a file system that indexes document content sure helps because then you need only do a content search on the word Penske. However, what if a memo or other document comes your way with an idea that would be perfect for the Penske account, but that document doesn’t use the word Penske anywhere? This is where purely content-based file management fails because you have no way of relating this new document with your Penske documents. Of course, you could edit the new document to add the word Penske somewhere, but that’s a bit kludgy and, in any case, you might not have write permission on the file. It would be far better if you could somehow identify all of your documents that have “Penskeness”—that is, that are directly or indirectly related to the Penske account. • Digital photo files often come with their own metadata for things such as the camera model and image dimensions, and some imaging software enables you to apply tags to pictures. • In Windows Media Player, you can download album and track information that gets stored as various metadata properties: Artist, Album Title, Track Title, and Genre, to name just a few. • The last few versions of Microsoft Office have supported metadata via the File, Properties command. • For all file types, Windows displays in each file’s property sheet a Summary tab that enables you to set metadata properties such as Author, Comments, and Tags. 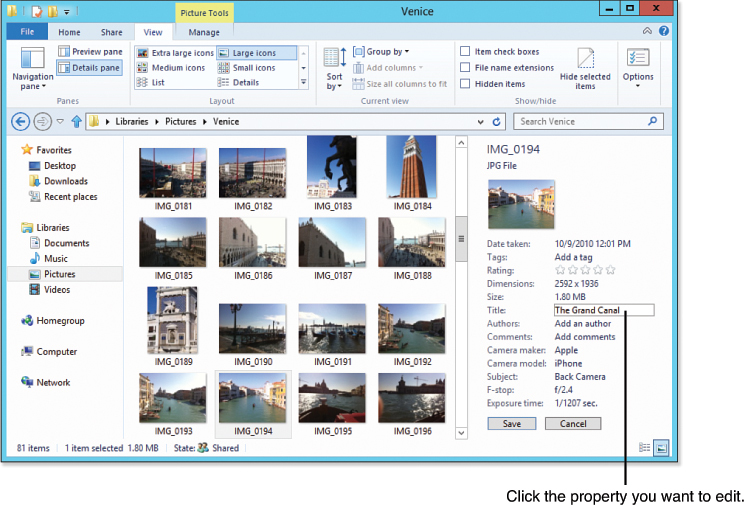 In Windows 8, metadata is an integral part of the operating system. With the Windows Search engine, you can perform searches on some or all of these properties . You can also use them to group and filter files. • In File Explorer, select View, Details Pane. In the Details pane that now appears on the right side of the window, click the property you want to edit. Windows 8 displays a text box in which you can type or edit the property value. For example, Figure 2 shows a photo’s Title property being edited. Click Save when you’re done. Figure 2. You can edit a document’s configurable metadata directly in the Details pane. • Right-click the document and click Properties to display the property sheet, and then click the Details tab. This tab displays a list of properties and their values. To edit a property, click inside the Value column to the right of the property. By default, in most folder windows, Windows 8 displays the Tags and Type properties in Windows Explorer’s Details view. (Specialized folders such as Music, Pictures, and Videos display other properties in Details view.) To toggle a property’s column on and off, right-click any column header and then click the property. Click More to see a complete list of the available properties.